Here is an interesting document that coincides with the largest youth festival in Europe that was held in Bala last month – Eisteddfod yr Urdd. As we know, the Urdd today is a flourishing organisation that has contributed greatly towards the language and culture of Wales. 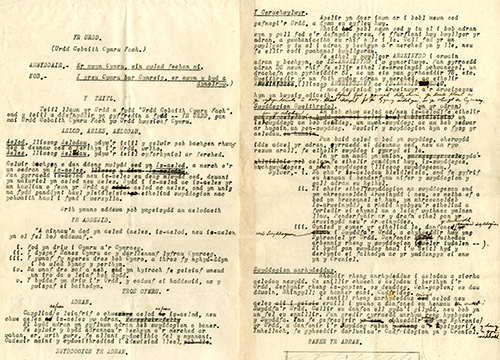 The Archives houses many items relating to the Urdd, including a Programme of the first Urdd Eisteddfod held by the Bangor District in 1930. All images, photographs and documents appearing on this page are subject to copyright restrictions. Bangor University Archives are responsible for the care and storage of the early College Records as well as our Archives Collections and General Collection of Bangor Manuscripts. All of these manuscript collections are bound by one common factor, their relevance to the history, people and topography of North Wales. However, their subject areas are wide ranging and are of national as well as local historical interest.